Less than 22 miles from Yosemite's south entrance, your escape awaits you, beckoning you to relax, reflect, read, write, create, all while savoring stunning views and breathtaking sunsets. This one bedroom, one bath with barbeque grill on the spacious deck, fridge, microwave, Crock Pot, toaster oven, electric tea kettle, and Keurig coffee maker provides all you need for a cozy stay. A recently added single futon accommodates a third guest if needed. Overlooking Oakhurst and Crane Valley, you're a mere 8-10 minutes from restaurants, grocery, art galleries, antique stores, movie theater, and Bass Lake. Skiers and snowboarders, you're only an hour from Yosemite Ski and Snowboard Area (Badger Pass) in Yosemite National Park. The resort offers downhill, tubing, cross-country, and snowshoeing trails. The area is a hiker's or mountain biker's paradise, and golfers will enjoy 9-hole River Creek less than 20 minutes drive away. The perfect alternative to a motel can be yours at a much better price and without the noise, where you can venture out and explore, or just hide away for days, viewing herds of deer, wild turkeys, an occasional fox or coyote, absorbing peace and tranquility in nature. We are recently retired teachers who moved up to Oakhurst 10 years ago to be near our grandchildren. We enjoy being outdoors hiking, snowshoeing, skiing and exploring with our Siberian huskies, Tioga and Tenaya. They love having doggy visitors to show around their property. We were looking for more space and fell in love with the property and the magnificent views, both day and night. It was truly love at first sight for us and we wanted to share this with those who love the mountain scenery and area as much as we do. Of course, Yosemite is very nearby, but so is Bass Lake for all kinds of water sports. Hundreds of hiking trails and biking trails are located in the immediate vicinity. We have maps and directions available for great views of waterfalls, creeks, forest land, Giant Sequoias, wildflowers, and abundant sunshine and clean air. A fun attraction for all ages is the Sugar Pine Railroad, open seasonally, offering an evening train ride, BBQ and entertainment venue. Winter brings sleigh rides and an ice skating rink at Tenaya Lodge, just 20 minutes away. And nearby Coarsegold and Mariposa offer Peddlers' Fairs and other events fun for the whole family. A small bar with 2 barstools is available for dining, as well as a table on the deck. Badger Pass in Yosemite is an hour away! Snowshoes are in the unit for your use. Great location, super clean and comfortable. Loved the pet accommodations! We had a great experience and could not be happier with our stay. Loved the seclusion of the property in the hills, just a short drive from town and south entrance to Yosemite. Our two big dogs also enjoyed their vacation and freedom they had roaming around the secured property. The rental was very clean, comfortable, and well stocked with everything we needed. The bathroom is large and seems newly updated. The deck has great views at sunset. We definitely recommend this spot to others (with or without dogs) and will be back again! Snow falling with a great view. Very nice property owners have a great setup. Everything you need is provided. Enjoyed our stay very much. Weather warmer than we expected for late January, a good time of year to avoid Yosemite crowds, although Glacier Point and some other roads inside the park were closed. Pet friendly and well-equipped cottage with nice views. 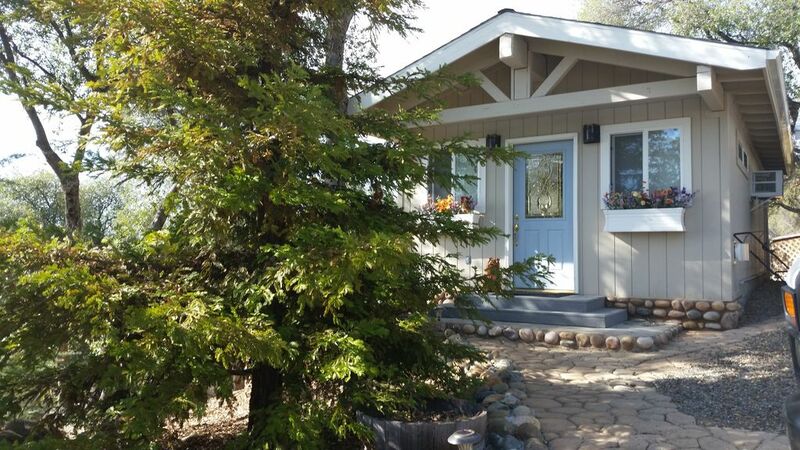 This cottage is located in the rolling hills outside of Oakhurst, and it is absolutely a wonderful place to "get away from it all". Quiet enough to hear coyotes in the distance, and there are turkeys and deer along the road. The deck has a wonderful view and the bed is super comfortable. It is super clean, and I would love to spend more time there! My husband & I had such a lovely short stay in this delightful cottage. It’s so peaceful and although quite small has everything you need for a short break. We have recommended it to our family as it would be perfect for them as well. Don’t be out off from on being outside Yosemite as it’s an easy drive and over out stay we were able to see such a lot but at the same time able to retreat to our quiet little oasis in the evening. If possible we will try and arrange another visit some time in the future. Thanks so much for the little snacks you left. They were very useful! Had a great trip--perfect for a couple or a couple with a small child. Everything as described.